While scrolling through my Instagram feed the other day, I stumbled across several dishes I get asked about frequently but haven’t posted here on my blog. As requested, I’ve decided to add some of them in over the next few months in between my planned content so that you can easily access them and use them in your weekly meal planning. First up is this easy (I love easy when it comes to mid-week meals!) 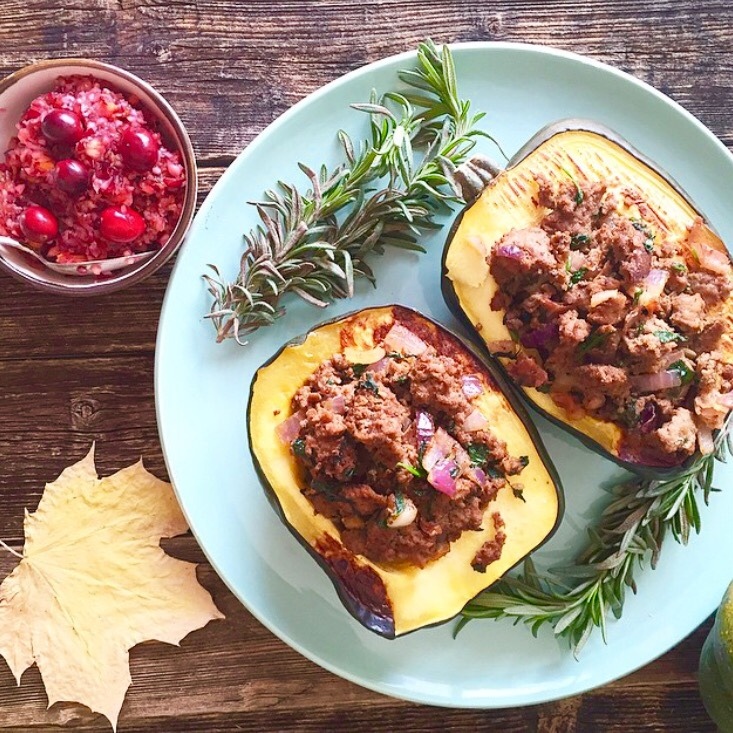 stuffed acorn squash that’s both filling and nutrient-dense. Plus, you can easily dress it up on the plate to transition from an easy weeknight meal to an entertaining staple. I love to make a few at a time and pop a half in the oven to reheat for a very filling and easy meal for one. This dish is paleo, allergen-friendly, Whole 30 compliant, 21-Day Sugar Detox compliant, and AIP and Low FODMAP (see variations below). The following amount easily feeds four people. Cooking time: 40-45 minutes. Preheat oven to 350 degrees. Slice 2 acorn squash in half, scoop out the seeds, and place each half cut-side down in a baking dish. Add 4 tbsp. of water to the dish, and bake about 40 minutes or until somewhat soft. While the squash is baking, brown the ground beef. Chop the prosciutto or bacon, the spinach, and the onion, and add all of these ingredients to the browned meat. Stir in, and add the chopped garlic or garlic powder, and salt and pepper. Remove the squash from the oven, place them right side up on a plate or platter, and fill the cavities with the meat mixture. Garnish with fresh herbs and serve. This dish can be a meal all by itself, or pair it with a green salad, and a fresh cranberry orange relish for a perfectly beautiful and satisfying meal for guests. If you enjoy this dish or know someone who would, please comment below, pin it to Pintrest, or share the link on Facebook!